De PDO database is especially developed for breed clubs and breeders to register animals and health information, show pedigrees and calculate COI and AVK. With this information it offers the possibility for making well informed breeding decisions to improve your breed. Animal characteristics, pedigrees, pictures, litters, breeders, owners, health-information, show en other results can be entered in the database. With this data you can make trial-matings, analyze pedigrees, calculate real time (up to) 10 generation inbreeding-coefficients and ancestor loss coefficients, and search for common ancestors. You can print the pedigrees in a PDF format. The database was originally setup for dogs but is now also used for other species like cats, hamsters, horses and rats. Users and administrators can search for animals in alphabetical order or by specific characteristics. 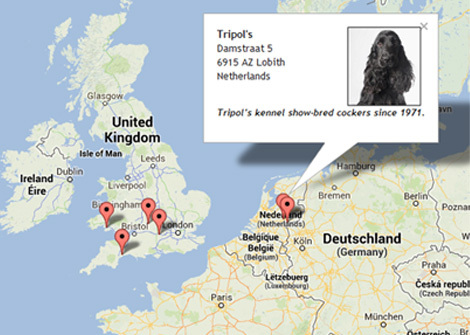 Breeders can be found in an alphabetical list, by area or even on a map. 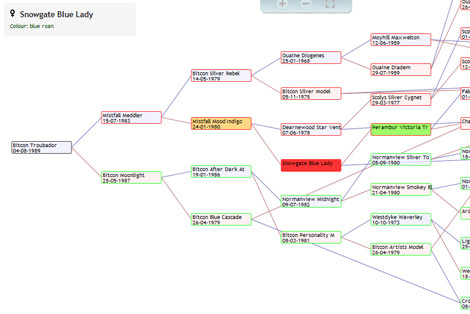 Animals can be easily added or edited from within the pedigrees. Depending on the settings users can make changes but these changes will only be publicly visible after approval by an administrator. Users can alter their own account information. The database is search engine friendly and can be indexed by search engines like google. You can start working in the database without installation-procedures. Technical knowledge is not required. We will host your database as a sub domain of .pedigreedatabaseonline.com. There are automated daily backups and we will periodically update the software to the latest version. You can make adjustments in the page-layout like changing colors and banners. You can also add extra information fields and switch on or off features like show results, litters, breeding animals and breeders. We will help you with the setup. All databases have the same features, depending on the version. If you have requests for extra features or changes we will try to add this if we think this is useful for all databases. You can make unlimited users and specify access to the various possibilities for different user groups. That way you can make a database that is closed to outsiders or completely open to allow your registered users to make changes to the animals. You can make custom information fields for breed specific issues like special health concerns, diseases or other information. Users can be assigned to user groups. You can set for each user group who can see, edit or approve information fields (per field) and set who can see or edit show results, breeders, litters and breeding animals. Of course we will help you with this setup. The database can be supplied with 3 languages (English, Dutch and German), but you can replace them with your own translation in any language you want. The data from the database can be imported or exported in CSV-format to use in excel or other common databases. There are automated daily backups and you can make manual backups in mysql format you can use in other databases. English Cocker Spaniels: open database with over 140.000 English Cocker Spaniels, 4500 users, a breeder list, an international stud dog list, health fields for breed specific issues and show and field test results. Litters are not listed here. This database gets about 2000 page views a day. 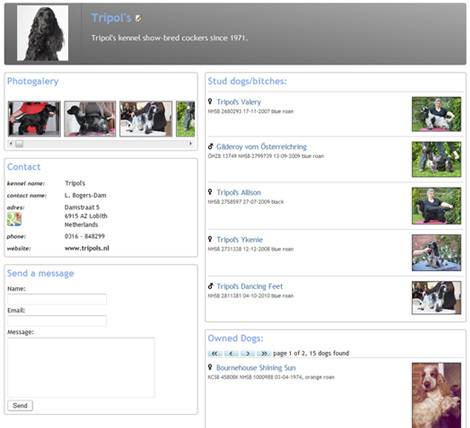 This database is a private project from pedigree enthusiasts. The database is available in two versions: a standard version and a club version with different pricing. If you are interested we can setup a trial database so you can try for a month before you decide. Registration number, color, date of birth, date of death, cause of death, country of birth, 3 pictures, breeder, owner, microchip number, etc. The same + 3/5 pictures. the type: text, drop-down with one choice, drop-down with multiple choice, check-boxes, date, etc. 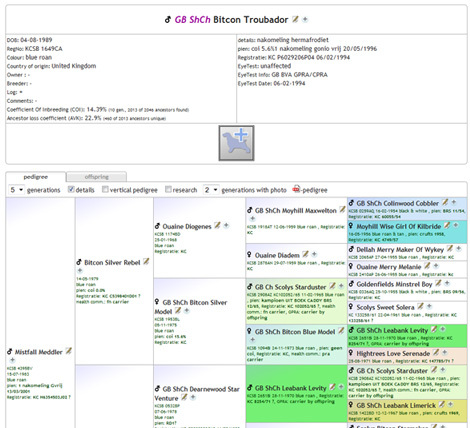 There is a page with a list with breeders. Search for breeders by name, country, region, on map or in alphabetical order. Breeders can have a page with their animals, litters, show and event results, contact information and a contact form. The same + search breeders by breed. Breeders can have a summary of registered tests per owned animal. There is a page with a list with litters or litter ads. Make a litter ad with a short advertisement text and pictures. Enter entire litters, record day of mating, advertisement text, pictures, etc. and add custom fields to keep information about all litters. No documents. Multiple documents, like DNA profiles or health test results, can be put publicly or privately online. With your own amazon S3 account unlimited documents can be stored. admins can add hidden accounts The same. editing can only be done by logged in users. All changes always have to be approved by administrators. It's possible to give certain users administrative rights for some or all fields and features The same. These are the most noticeable differences between the two versions. It is always possible to upgrade to a club version but it not always possible to store the same information when you downgrade to the standard version.